Greece is seeking a political solution to the issue of post-WWII reparations from Berlin, Greek Foreign Minister Nikos Kotzias said in an interview with a German newspaper, suggesting the creation of a joint commission of experts from both countries. 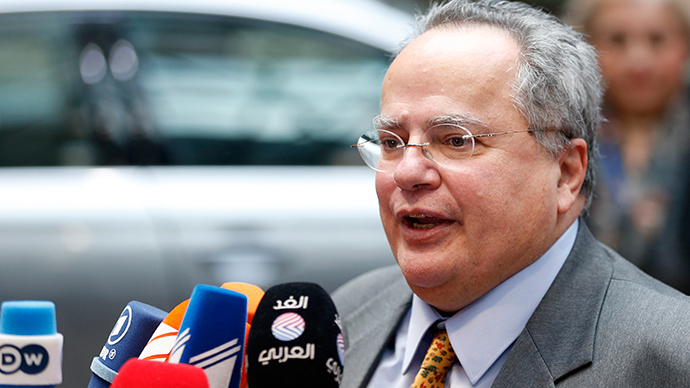 “Athens wants to come to an agreement regarding the issue of reparations…We need to find a common denominator,” Kotzias said in an interview with Süddeutsche Zeitung. The Greek FM visited Berlin on Sunday. On Monday, the German capital is greeting the Greek PM for talks with Angela Merkel. Despite rumors of possible seizures of German property in Greece (should there be no agreement), Kotzias emphasized that Athens is looking for a political solution to the issue, rather than a legal one. Last week, the Greek deputy defense minister told Sputnik that he had made an official request to Moscow for it to provide Athens with any archival documents on German occupation that could help Greece in securing reparations from Berlin. “There was an opportunity to make an official request on behalf of the Greek government and the Ministry of National Defense to provide archive documents – if there are such in the archives of Russian Ministry of Defense – that could aid our country’s efforts to receive compensation for the civilian, moral and economic losses our country suffered during the 1941-1944 occupation by Nazis and Wermacht,” Isihos said. Athens is seeking reparations from Germany for the Nazi occupation of Greece during World War II. Greece’s new left-wing Prime Minister Alexis Tsipras again brought up the issue as a bargaining chip with Germany in negotiations with the Eurogroup over restructuring Greece’s massive debt. Greece has claimed that Germany owes it money for the forced wartime loan for a long time, but this is something that most politicians in Berlin refute. After unconditional surrender in 1945, Germany did not agree to clear up reparations, although then it was financially bankrupt, and at the time Greece, as well as many other countries, made no objections.